2020! 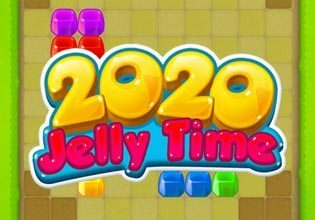 Jelly Time is the latest edition of the successful puzzle game 2020. In 60 challenging and fun levels, your mission is to fill the horizontal and vertical lines with the jelly shapes to clear the line and reach your target score. Be aware not to lose the level by running out of moves before reaching the goal. This game doesn't only have a jelly theme but also has boosters which will help you if you are ever stuck. The cool boosters are changing shapes, clear one field, clear one type and clear a whole area. With its beautiful interface and engaging levels, you will not stop playing 2020 Jelly Time until you finish it. Show off your skills in this challenging and fun puzzle game. Play 2020 Jelly Time now for free!